Do the mid-conference season polls mean anything? The comments I’ve received on the post-conference Labour polls contain a lot of encouraged Labour supporters thinking that the mood may have changed, sometimes seemingly quite bewildered about why people are quite so dismissive of the polls showing a smaller Labour lead. I’ve been phoned up by some journalists this morning asking what weight we should give polls showing Labour catching up with the Tories. The answer is – for now – not much at all. It is, of course, possible that Labour caught the public mood at their conference and things have indeed changed, but looking at polling around Labour conferences in the past, it seems more likely that it is a publicity boost. In the past when party conferences do have any meaningful effect, it has been extremely short lived. The graph below shows Labour’s ratings from YouGov (since they tend to do more polls around conference than other pollsters) at each party conference since 2002. The first column for each year is Labour’s average rating from the start of August that year until the beginning of conference, the red column is the YouGov polling done immediately after Labour’s conference (in a few cases the average, when YouGov did more than one poll in the few days afterwards). The final two columns are the Labour score in YouGov’s monthly polls at the end of October and November. 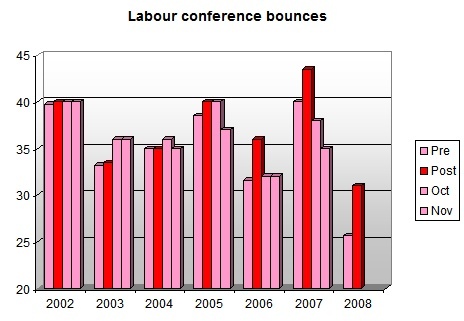 Labour enjoyed boosts in the polls from their conference in 2005, 2006 and 2007, and in every case they fell back down within a couple of months – in 2006 and 2007, they went back down almost immediately. Only looking at 2003 does the conference season appear to have given Labour a long term boost – but that is actually the effect of the Conservative party collapsing into internal leadership ructions after their own conference. Of course, it is hard to draw rules as every conference is in its own way its own special case: in 2007 there was the non-election announcement, 2006 was Blair’s valedictory conference. It’s possible that this one will be different and will have a lasting effect, but looking at recent conferences, there aren’t many encouraging precedents. No doubt there will be plenty of polls next weekend – if nothing else we are due YouGov’s monthly poll for the Telegraph. If Labour have still narrowed the Conservative lead then, then we can start talking about the game having changed. If not, then only when any Conservative boost from that conference has died away will we actually know if the conference season has made a difference – but it would be quite an unusual conference season that did. The other factor at play here is the economy. There was possibly some indication of a Labour increase in the ComRes poll on the 20th (though not reflected in the YouGov one a day before). If the public do feel that Labour/Brown and Darling are better equipped than the Tories/Cameron and Osbourne to steer the economy through hard times, and have taken firm action over HBOS and Bradford & Bingley, then there may be more than a conference boost in current polling. What is does show is that things are still fluid, with the Labour vote firming up/switching from other parties. This shows that there is still a large pool of undecideds/weak Labour voters out there, and that the electorate is not “fixed” in terms of the next election. Did John Major enjoy post-conference boosts in 1995/6? Good question – but alas almost impossible to answer. The sort of mid conference polling we get now really didn’t happen in the same way back then, probably because face-to-face polling didn’t provide the same rapid turnaround. All the post-Labour-conference YouGov polls I used for the graph above really were done within a few days of the end of the Labour conference, if you go back and look at polls from the 1990s there aren’t that sort of immediate reaction polls, you have to wait for the normal monthly polls which are often a fortnight or (in the case of ICM) almost a month afterwards when any bounce would have already gone. That’s what I was already saying last year about the volatility of polls during the autumn conferences… It always puzzles me how 15-20 % of people can flip-flop over the period… no sense! Its not really that many just 5%. eg Tories on 45 Lab 25 lead 20. After Lab conf 5 change their mind so then Con 40 Lab 30. lead of 10. The answer to the question is no. We should wait until things stabilise next week, when the Conference season is over. Maybe people are starting to realise that a Tory government could be less than two years away. That notion would still make a lot of people vote Labour. I get the feeling that the tories have overdone the mudslinging. It is ludicrous to blame brown for the US banking crisis for instance. People have started to take the crisis seriously, and a mudslinger is not the best choice to sort it out. Brown has the experience and gravitas that Cameron lacks. I think the tories have realised their mistake too. There has been a noticable drop in Brown bashing recently. The Tories will not be heard now. Tonights dramatic events in USA, the DOW collapse, and no doubt FTSE’s in the morning will occupy all commentary. What was interesting after the Vote failure in the House this evening was Obama blaming the years of “Irresponsibility” on the Republicans. Gordon Brown’s UN speech phrase has thus been roled out by a Democrat who thinks it will help him get elected, and a Conservative who thinks it will help get him elected!!! I don’t think anyone is blaming Brown for the US Banking Crisis, JM Williams. Colin – I do wonder what the polls would be saying had Howard won in 2005 and not brought in the credit controls (that Osborne even now is not advocating) that might have lowered household debt. The best thing for Cameron to focus on to-day is the “waste”, “incompetence”, “dithering” attacks that worked last year, and not the no-win explanations of who was to blame for bank collapses. He even suggests GB pinch some of the ideas in it. People want solutions, reassurance & help.It may not be possible for politicians to provide any of these at present. Of the 12 republicans who took offence at Polosi’s attitude and (allegedly) switched as a result, Barney Frank said : “give me their names, and I’ll go talk uncharacteristically nice to them”! I don’t detect much media approval for a toothless quango, otherwise described as “office of financial warning signals” – why on earth can politicians not rely on their own analyses and take responsibility? Do we really need “OFCAT”? Well if he carried on regardless he would have been called arrogant & out of touch. I just loved Brown’s curmudgeonly acceptance of co-operation through gritted teeth-he doesn’t really do cross party co-operation does he…unless it’s setting up geriatric ex prime ministers. And as for Yvette Cooper-she couldn’t help herself could she! “…..The years of slippage also saw the Treasury’s forecast for the peak in public sector net debt rise from 31% of national income in Budget 2002 to 39.8% in Budget 2008, leaving virtually no room for manoeuvre in the event of even a modest economic slowdown, let alone one as big as that on which we are now apparently embarked. Would Mr Osborne’s reforms have ensured a happier ending? Well, if politics did intrude on the Chancellor’s predictions and his decisions regarding the cycle, then placing responsibility for fiscal forecasting in the hands of an independent Office of Budget Responsibility – with access to the same privileged information on spending and revenues that the Treasury currently enjoys – might have prompted earlier action to strengthen the public finances. Chote makes suggests that the members of the new Office could enhance their independence if their terma are longer than a parliament. Call me cynical or even McCynical but i couldn’t help wondering how many members of the Senate were voting “Yes” because they or friends had bought stock cheap and hoped it would rise or voted “No” because they were hoping for it to drop so they could pick it up cheap…..
That is very cynical Councillor. Actually the Senate votes tonight-probably on an amended bill- so I presume you were talking about the House who voted on Monday. Congressmen and women had a very difficult call to make. Many of those who voted ‘no’-invariably in marginal seats- did so because of fierce opposition to the bill from their constituents and with reelection only a month away that to some extent was understandable . I suspect that only a few brave souls in Wall Street are working the markets right now-the rest of the activity is just institutional panic. Congressmen are as scared as the rest. It’s their seats they are worried about -not making money. Nick, I don’t think scepticism is misplaced, but outright cynicism is usually a projection of one’s own prejudices – perhaps we should enquire some more about SNP practises. Frankly I doubt stock optioning by elected representatives in the US could be gotten away with as trades are traceable. I agree it is far more likely that they are being influenced by the prospect of looming elections where large proportions of the house have their public voters to consider. What’s interesting about this is that another failure to pass the amended bill could lead to the splits in the parties deepening to the extent that the nay-sayers are able rally around this common policy plank across party lines. It is possible (though I haven’t looked at it in detail) that the strongest opponents to the bail-out are the more independent-minded (as they are more likely to be standing in potential swing seats where the independent vote is decisive). So is the US on the verge of turning into a three-party system? This would definitely be of interest on this side of the Atlantic because I can’t see how the party lines would be redefined along lines other than we have in this country (I recall The Economist published a survey of the values of registered voters showing that US independents were closely aligned with the LDs). If political alignment starts crossing borders then because we are all facing similar issues I predict our voting habits will start to coalign more closely too. In USA, share ownership is much more widespread than in UK. The plunge in DOW yesterday will have hit ordinary people much much more than their perception of the taxpayer cost inherent in the bailout. I think that will help swing support behind the revised Bill. I agree with you that the vote was all about local, Main Street politics-something that still has meaning in USA, unlike this country. I have to disagree with some contributors above saying that the Tories should stop “Brown Bashing” and blaming him and Labour for our finacial problems. Brown has been in charge of our finaces for 11 years – it is he that allowed this to spiral out of control and now has no money to help us out of it – the more the Tories say it , the more the people will agree with it. Even the disruption of the Tory conference this week with world events – will not stop the POLLS going back up for the Tories in the next 7 to 10 days. If like me, the rest of the UK have just got their energy price rise bills this week – that won’t help Brown’s cause ! Well maybe Mike but Cameron eschewed ” Brown bashing’ yesterday and it seems to have resonated with the pundts and newspapers at least-public reaction will only become clear in a day or two.